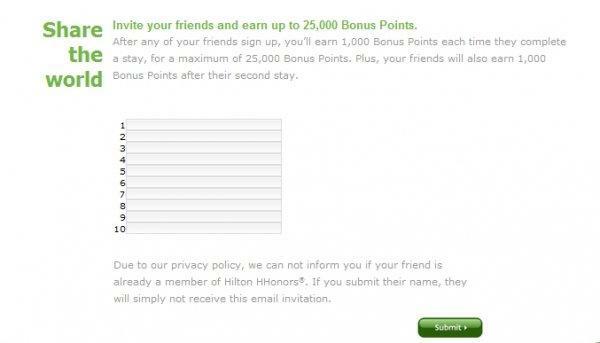 Hilton has also has a promotion for referring friends to join HHonors. This offer is valid for new member referrals and stays until December 31, 2014. EDIT: This article has been updated with a new link for referring member on March 3, 2014. You can earn up to 25,000 Hilton HHonors points (1,000 points per stay that the person who you have referred does) and the referred earns 1,000 bonus points after their second stay. You just filled out the web-form and Hilton forwards the sign up invitations. The terms state that this would be available for those that received this offer by email, but at least the sign up worked using my account and likely works using yours too.